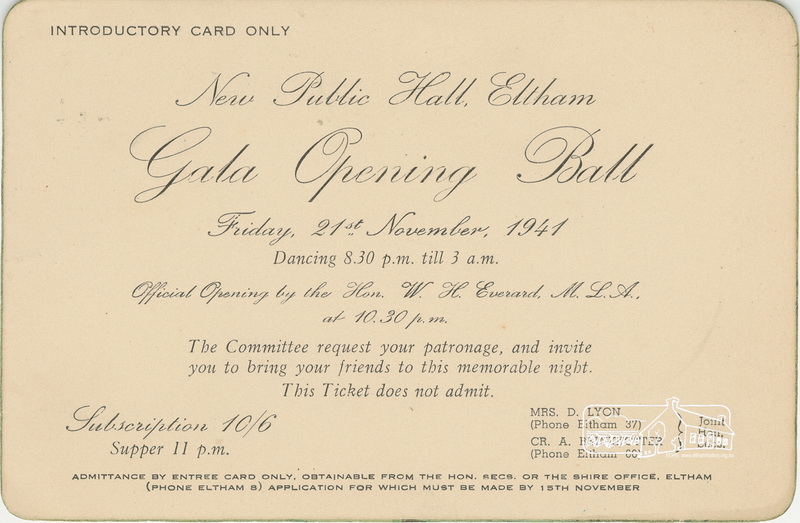 ThrowbackThursday: Gala Opening Ball,New Public Hall, Eltham, November 21st, 1941 | Eltham District Historical Society Inc.
Photo: Eltham Hall (Artist’s impression); Eltham and Whittlesea Shires Advertiser, 28 November, 1941, p. 3. #ThrowbackThursday – Today we time travel back 77 years to November 21, 1941. Our boys have been fighting in Europe and the Middle East for almost two years now and our district has suffered losses. The headlines in today’s Argus describe a terrific attack by the RAF on posts in Libya in which our airmen assisted. In just 16 days the Japanese will launch a surprise attack on Pearl Harbor, devastating the US Navy Fleet, and catapulting us into the Pacific War, right on our very doorstep. It is just before 8:30 p.m., the sun having set just over an hour ago. A recent Gallop poll shows people are in favour of daylight saving time two to one but we will have to wait another year till it is introduced. We have gathered in Arthur Street at the corner with Maria Street, near the base of the steps leading up to the swanky new Eltham Public Hall and Shire Office. The lights at the top of the steps bask us in their glow. It is overcast and 58 degrees (14°C), down from the maximum of 64 (18°C) at 3 p.m.. A few showers fell in the morning but it is dry now and predicted to be a fine day tomorrow, which is good as we have a big night ahead for us. For we are about to walk up the steps and enter into the new hall for the first time to attend the Gala Opening Ball which commences in just a few minutes, finishing in the wee hours of the morning. This is going to be a grand event; the official ceremony commences at 10:30 p.m.. Everyone is dressed to the nines and the air is full of excited chatter. The external walls of the building are constructed with Templestowe bricks which were selected for use because of their comparatively low initial cost and because such a brick facing reduces maintenance cost to a minimum. In a few weeks the new Shire Offices will also be ready for occupation, and for the first time since Eltham was created a Shire in 1871, its municipal business will be conducted in surroundings befitting its dignity. The combined structure of the Hall and Offices provide Eltham with a focal point for development, and is a fine building setting an example for future improvements to the township. The design affords convenient and appropriate entrances to both the public hall and the Council Chambers befitting their importance whilst achieving a satisfactory linking up of the two buildings. The Municipal Offices consist of Council Chamber, general office, rate collector’s office, secretary’s office, engineer’s office and store room. They have been designed to provide for an additional storey when warranted by future development. The entrance hall and Council Chamber are panelled with specially selected ribbon grained Queensland walnut with all other walls sand finished internally. A feature of the Council Chamber is a fine open fire place built of Ballarat tapestry bricks. The windows are of steel frames with a section glazed with broad reeded glass for privacy. The whole building has been roofed with “Fibrolite” which will act as an insulator and will afford effective protection against the effects of condensation on the ceilings. Internally and externally, a pleasing and lasting effect has been achieved by the restrained use of color in pastel shades. 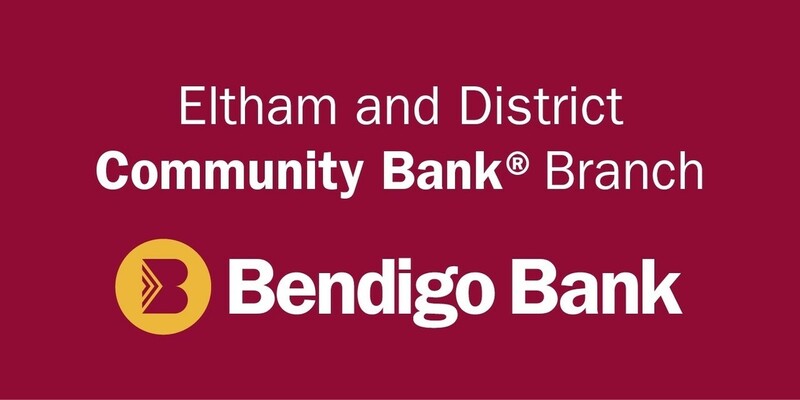 The site upon which the buildings stand will lend itself to a satisfactory garden treatment and development, and its elevation and central position in the Town of Eltham renders it a landmark around which the shire should maintain its recent growth and development. The hall section of the building comprises a main hall, stage, two dressing rooms, kitchen, two cloakrooms and foyer. To provide for small meetings, the men’s cloak room and foyer are divided by means of folding doors. The kitchen is fitted out with ample cupboarding, copper, stove and power points and is insulated with fibrolite wall board. A specially constructed brick and concrete bio cabin has been constructed above the foyer. Flush walnut veneer polished doors have been used throughout. Right on 8:30 the doors swing open and we are embraced by the surge of people. Passing through the doors we immediately notice how clean and bright it appears with its white walls, and Tasmanian Oak hardwood floors; not a nail in sight thanks to the secret-nail technique stipulated in the design. The interior treatment of the main hall consists of a “Masonite” dado 4ft. 6in. high above which are fibrous plaster walls and a coved fibrous plaster ceiling. Indirect artificial lighting has been installed by the introduction of scientifically designed fibrous plaster dome reflectors which are first illuminated by metal suspension electric light fittings. These lights are supplemented by wall bracket lights. The atmosphere created adds an element of glamour in addition to the many beautiful gowns worn by the ladies and smartly dressed men. The acoustics have been catered for through the proportions of the building in conjunction with the elimination of inside wall piers and the use of “Perfotile” sound absorbing tile wall treatment. About 300 people are already in attendance yet conversation is easy to hear. The stage is massed with flowers and shrubs carefully arranged by Mr. W. Allen; contrasting with the striking red, white and blue of the Union Jack draped at the back. A large bowl of delphiniums sits in front of the footlights. Four years earlier, in September 1937, a group of ladies met to form a Ladies’ Committee to assist the General Committee in raising funds for the hall. Those present were Mrs Allen, Mrs Bowman, Mrs Hickey, Mrs Rains, Mrs Boake and Mrs Lyon. As there were only six present, they elected to remain in the interim as a Social Committee to arrange catering, etc., for the two dances that had been arranged for September 29th and October 30th of that year. Both those dances proved a great success. Mrs McAdie joined the committee in October. The Ladies’ Committee was officially formed at a combined meeting of the General and Ladies’ committees held on April 6th, 1938. Mrs Boake agreed to be President, Mrs Lyon as Secretary and Mrs Rains as Assistant Secretary. Other members included Mrs Browne, Mrs Forde, Mrs Jarrold, Mrs Bradbury and Mrs Taylor. By 1941 their numbers had grown to include Matron Wilson, and Mesdames Andrew, Brinkotter, Cloney, Walker, Parsons, Crick, Ballenger, Travena, Hurst, Shields and Le Brocq . A number of these ladies who will eventually move on and become part of the Women’s Auxiliary of the Eltham War Memorial Trust, have been working tirelessly organising events and raising much needed funds to arrive at this special occasion today. As we take in the splendid surroundings we overhear many complimentary remarks about the wonderful job achieved by the members of the Hall Committee and the Ladies’ Committee which had supported the General Committee over many years. Plenty of refreshments are available; there are tables laden with cakes and other treats as well as another table of cups and saucers in a Blue Willow design for those wishing to partake of a cup of tea. At 10:30pm there is a ringing of spoons on glasses. The official opening ceremony by the Hon. W.H. Everard, M.L.A. is about to commence. Councillor A. Brinkkotter, secretary of the Hall Committee, introduces Mr. W. Hickey, the president, and in doing so remarks that Eltham has succeeded, after many long years of fighting, in erecting a new hall and civic centre which had been badly needed. Mr. Hickey says that although for a long time it had looked as though the erection of the building would be postponed indefinitely, at last the new hall was completed. Councillor E. Andrew, vice-president of the Hall Committee, extends a welcome to visiting councillors from Heidelberg, and adds that he is proud to be present on such an auspicious occasion. The Hall Committee has worked for years to provide the town with such an asset, and deserved the success which had crowned their efforts. Mr. G. L. Chandler, M.L.C., extends his own congratulations to those who had been instrumental in having such a fine hall built. Of its kind, he adds, it is the best hall in which he has ever been. The gathered are disappointed to learn from the Shire Secretary, Mr. C.L. Tingate, that the Shire President (Councilor Price) has been kept away due to illness. Mr. Tingate recalls the fire which destroyed the old Shire Offices at Kangaroo Ground in 1934 and the opposition which then existed to the Shire Offices being transferred to Eltham. 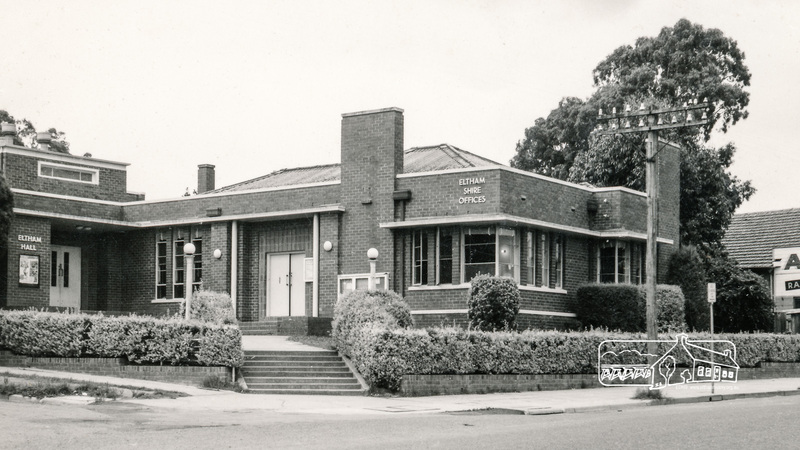 Councillor Braid tells the the assembled gathering that efforts had been made for years to get Shire Offices and a Hall in Eltham, and it was only when the present committee had made a concerted effort and a wonderful offer to the Council, that their object had been achieved. “The South Riding Councillors have been trying to avoid increasing the rate, and they have managed to erect the Shire Offices without any increase,” he says. Mr. Everard also says that he considered it was due to the efforts of six Eltham people that he was first returned to Parliament. Mr. Everard then declares the hall open and expresses hope that “this red letter day for Eltham” will live long in the memories of those present. Councillor Brinkkotter returns to the stage and comments on the wonderful work done by the members of the Hall Committee in the last two weeks, fixing up the seats – all armchairs – placed around the walls of the hall. He also expresses thanks to the Ladies’ Committee for its untiring efforts in support of the Hall Committee, and on behalf of the committee he thanks the Council, the architect (A. K. Lines and MacFarlane of 440 Little Collins Street and Greensborough), the contractor (A. E. Smart of Thomastown) and all the men who had worked on the building, along with the public who had so generously assisted with the expense. And with the speeches completed, the band starts playing again and the floor becomes alive with couples dancing while others retire to the lounge chairs. Those present include: Mr. and Mrs. D. Lyon, Mr. and Mrs. W. Walker, Mr. and Mrs. Collis, Mr. and Mrs. H. Shields, Mr. and Mrs. W. Allen, Mr. and Mrs. J. Crick, Mr. and Mrs. E. Staff, Mr. and Mrs. J. Ryan, Mr. and Mrs. J. Ballenger, Mr. and Mrs. Butler, Mr. and Mrs. G. LeBrocq, Mr. and Mrs. J. Kent, Mr. and Mrs. D. McAdie, Mr. and Mrs. S. Browne, Mr. and Mrs. McNeill, Mr. and Mrs. Jones, Mr. and Mrs. G. J. Gillberg, Mr. and Mrs. Bryan, Mr. and Mrs. J. Bell. Mr. and Mrs. A. Parsons. Mr. and Mrs. J. C. Rains, Mr. and Mrs. L. Jarrold, Mr. and Mrs. Hutchinson, Mr. and Mrs. J. N. Burgoyne, Mr. and Mrs. C. Hurst, Mr. and Mrs. J. Cresp, Mr. and Mrs. S. Kirkland, Mr. and Mrs. A. Schulz, Mr. and Mrs. Bryce jnr., Mr. and Matron Wilson, Mr. and Mrs. C. W. Sinclair, Mr. and Mrs. W. Squire, Mr. and Mrs. L. Iredale, Mr. and Mrs. H. Williams, Mr. and Mrs. W. Adlington. Mr. and Mrs. C. L. Tingate (representing the Shire President), Councillor and Mrs. E. Andrew, Councillor and Mrs. A. J. Braid, Councillor and Mrs. A. Brinkkotter, Councillor and Mrs. W. Clinton, Councillor and Mrs. J. L. Ryan, Councillor and Miss Lines. The Hon. G. L. Chandler, M.L.C. and Mrs. Chandler, Mr. W. H. Everard, M.L.A. Mesdames E. M. Boake, Allen, Pennefather, Northmore and Johnston. Misses Beryl Northmore, Adele Peacock, Jean Glasgow, Olwyn Bryan, Mona Baker, Muriel Butler, Dorothy Butler, June Rains, I. Dudfield, Brennan, Scott, E. Bradford, Allen, S. J. Taylor, B. Simpson, A. Brookes, Somerville, Finlay, D. LaFranz, O. Parsons, E. Doney, I. Bond. Messrs. R. Taylor, W. Boake, H. A. Davies, R. Marks, D. and J. Glasgow, Carrucan, Leo and Lou Brennan, A. Lowerson, G. Burges; K. Browne, L. Bryan, R. Wigley, L. Doney, W. North-more (R.A.A.F. ), V. McColl, R. Finlay, Bryce, sen., Maclurkin, A. Smart, C. Brodie, and Dr. Bradbury.